Exchange files and folders between multiple devices seamlessly. Looking for File Storage Companion, not File Transfer? What's the difference? No configuration required, no need to enter an address to connect. Devices are automatically discovered. Drag folders and files and they are transferred to your devices and computers in seconds. Without iTunes and without USB cable. 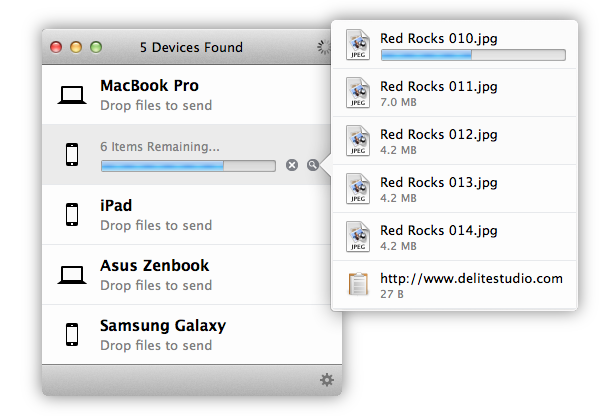 File Transfer works cross-platform on Mac, Windows, iOS, and Android. It works out of the box. Install, run, and transfer. It will just work. Ultrafast transfers. Send photos, videos, and files of any size in seconds. Instant notifications. You'll know immediately when a new file arrives. Send and receive files and folders. 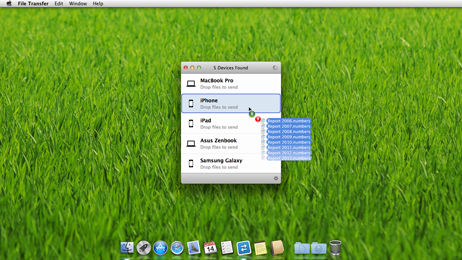 Simply drag and drop them into File Transfer or onto its Dock icon. Send and receive the contents of your clipboard. 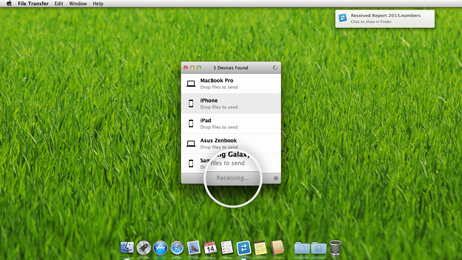 Select a text, launch File Transfer, and click on the "Edit > Send Clipboard" menu. Or just type ⌘V. Compatible with File Storage, the best file manager for iOS. Find answers to commonly asked questions about File Transfer. Running into problems with File Transfer? Here are a few tips. Spend a few minutes going through this guide to learn some File Transfer basics. I needed an app to transfer videos from m my Apple mini (With Mountan Lion) to my iPad mini. I tried a couple of old dependable apps that I had used previously but, somehow, they didn't work. Then I tried "File Transfer" and it worked perfectly. I'm very picky about app performance, and I can attest that this app does exactly what it claims. Приложение крайне актуально для тех, кто использует iдевайсы для хранения множества файлов и имеет необходимость постоянного свободного обмена ими между iдувайсом и mac'ом/macbook'ом, не обращаясь для этого к iTunes. Отличительной чертой данного приложения является простота самого обмена - программа клиент-серверного типа, то есть имеются приложения для OS X и iOS, соответственно обмениваясь файлами достаточно просто перетащить файлы из папки в Finder'е в окно программы и они сразу же отправятся на iдевайс. Наоборот аналогично - выбираете в iOS-клиенте нужные файлы и отправляете их на ваш mac. Также отмечаю, что iOS клиент отлично справляется с функциями файлового менеджера. Ottima applicazione. Concorda con quanto espresso nella recensione dello sviluppatore. I prodotti connessi alla stessa rete locale dialogano nello scambio di file, con velocità sorprendente.